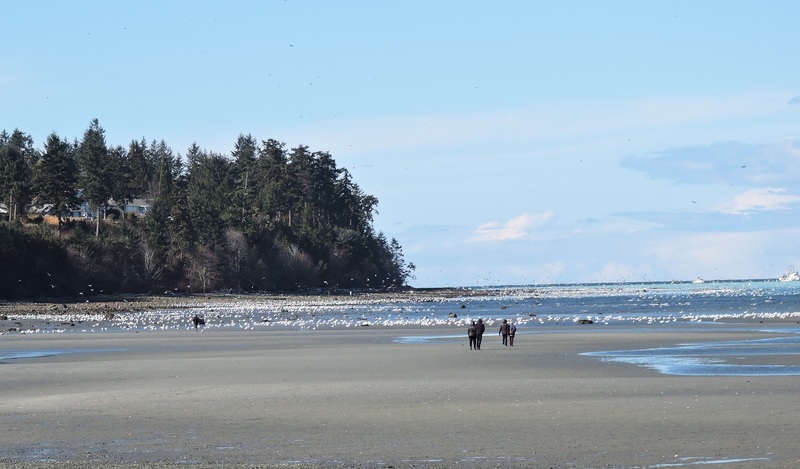 Every year in early Spring - any time from the last part of February through to April, we get to witness an amazing event here along the shores of Vancouver Island, British Columbia, Canada. 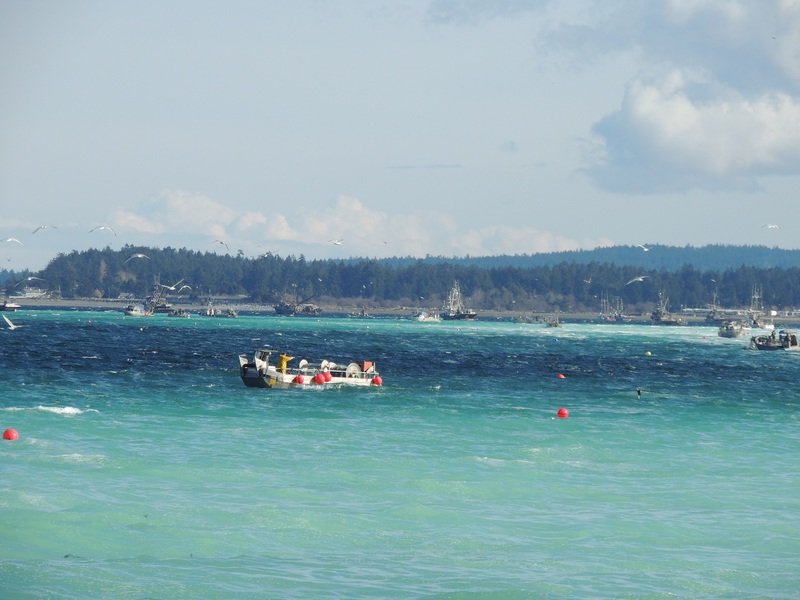 This year there was a particularly large herring spawn, covering a very large area. I have posted this information in another (eagle) forum, but I thought I'd like to share it with those of you who visit here. 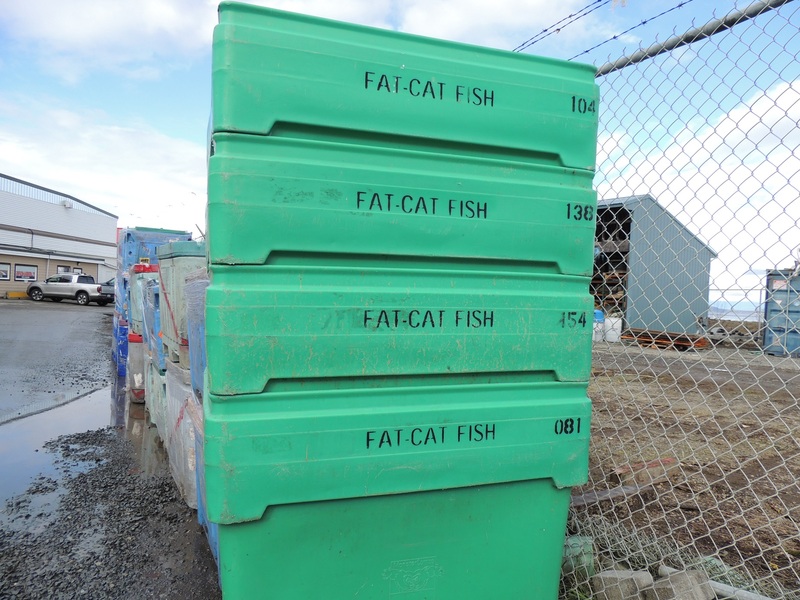 On Saturday I intended to go to French Creek, where the boats are unloaded and some of the herring is processed, just to see whether there was anything happening. 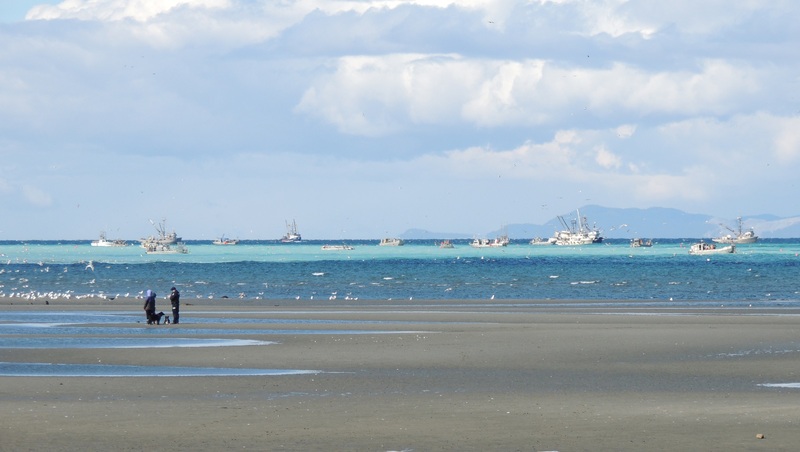 I didn't even get to French Creek before seeing many fishing boats in Parksville Bay. So we pulled into the parking lot and began taking pictures. 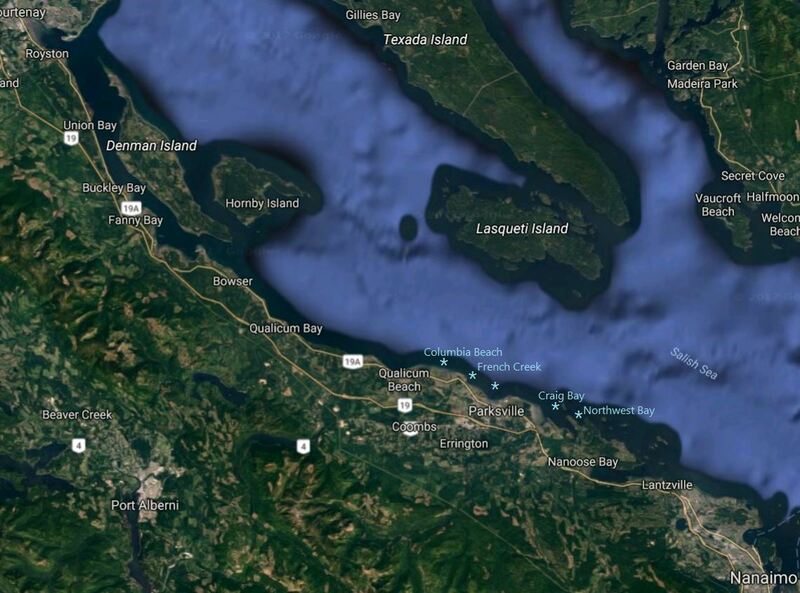 Below is a map of the area from Courtenay to Nanaimo, and I have indicated (with * and in light blue) the herring spawn locations that I visited over the next few days. 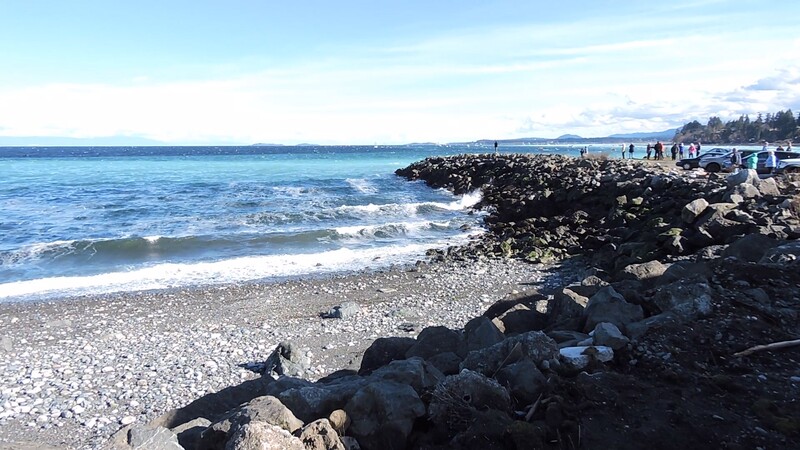 Below is the beach access at the western end of Parksville Bay, and my first opportunity to take photos. 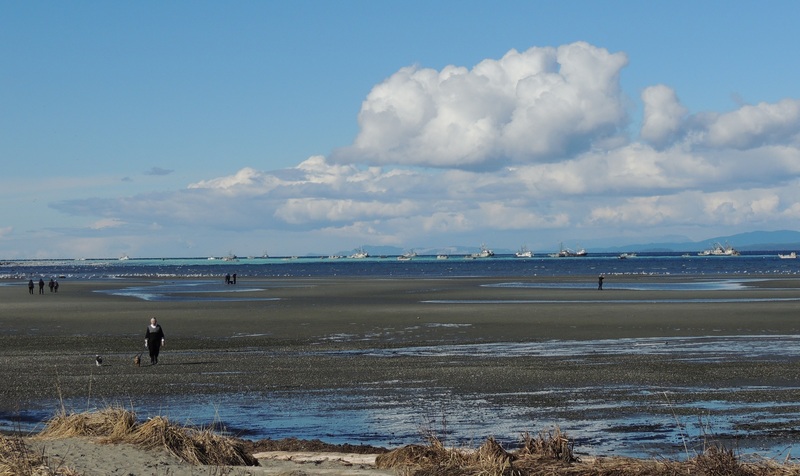 Below is a wider view of the Bay, showing the many fishing boats and the huge expanse of Parksville's beach. Look at all the gulls! 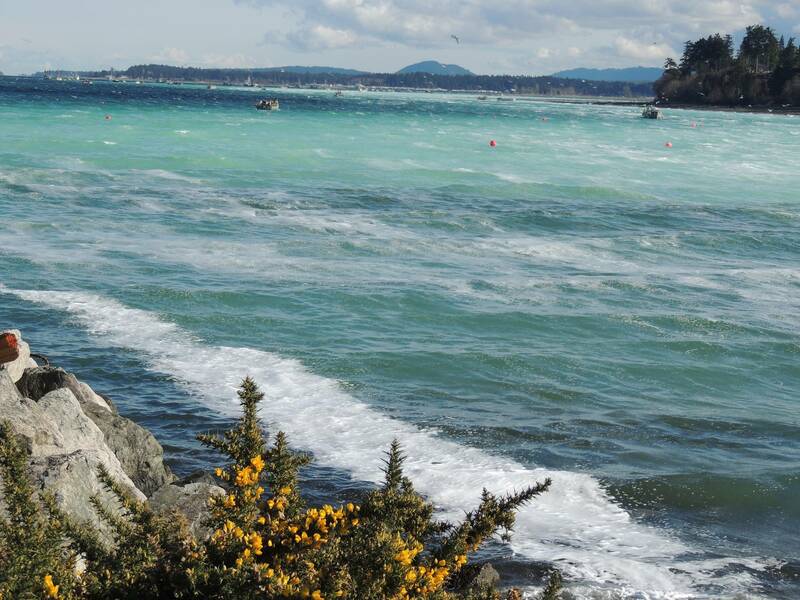 More photos and a video of the herring spawn and the fishing boats in Parksville Bay on March 4. A couple of closer views (above and below). 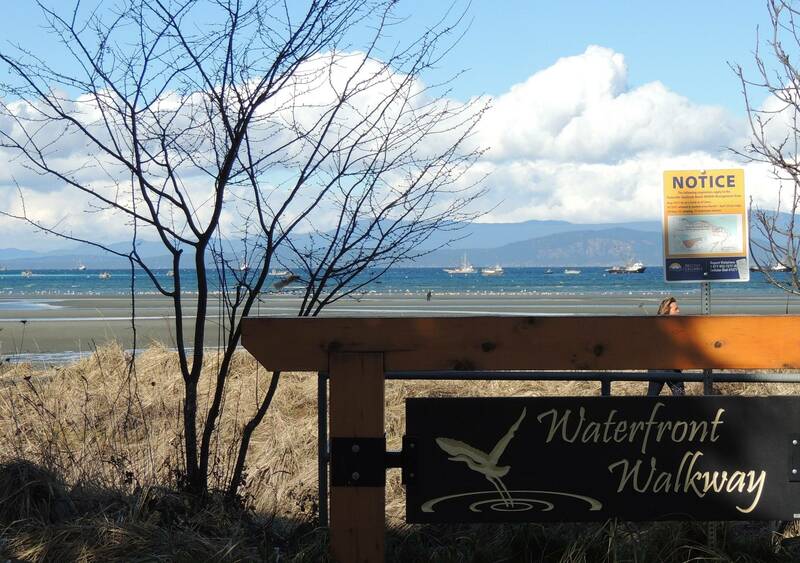 We travelled further along the coast to French Creek and were surprised to see that the spawn area stretched that far, from Parksville. 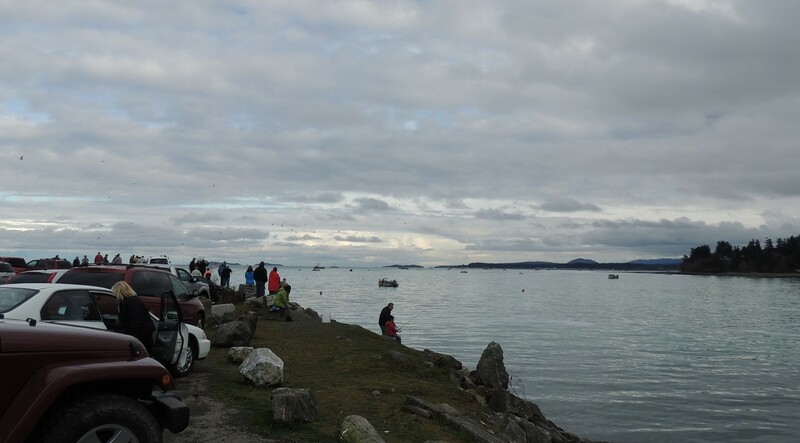 The photos and videos below show the view towards Parksville, which is where the distant fishing boats are. Lots of people come to this area to take photos, and just take in the scene, including this cold and windswept person! 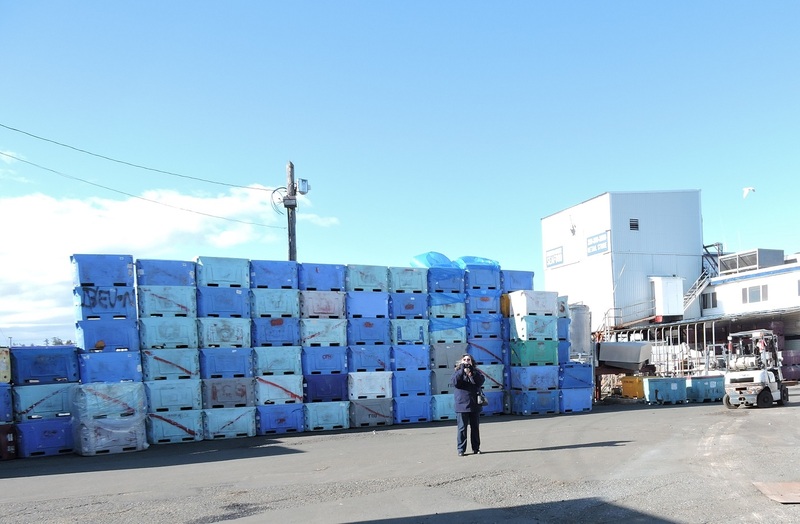 Yours truly above, in front of the mountain of containers waiting to be filled with herring, at French Creek on March 4. 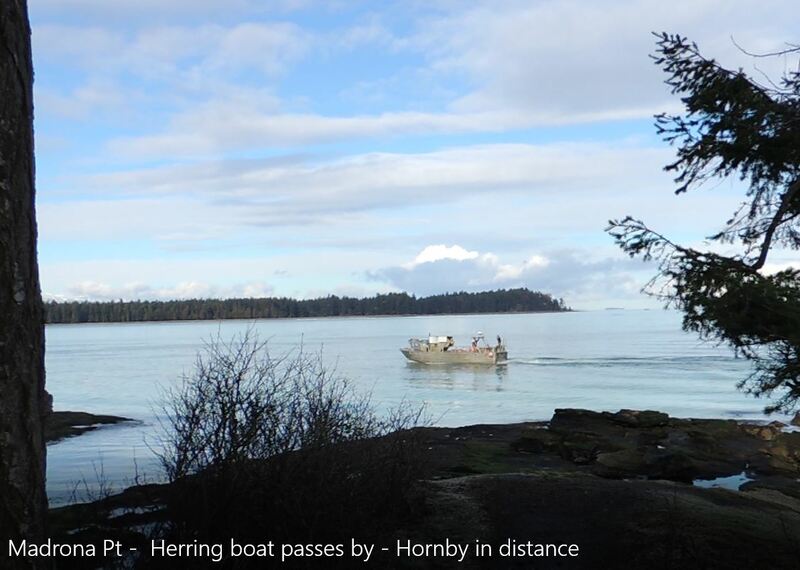 On this day we decided to check some of the webcams around the area to see where the herring spawn was. 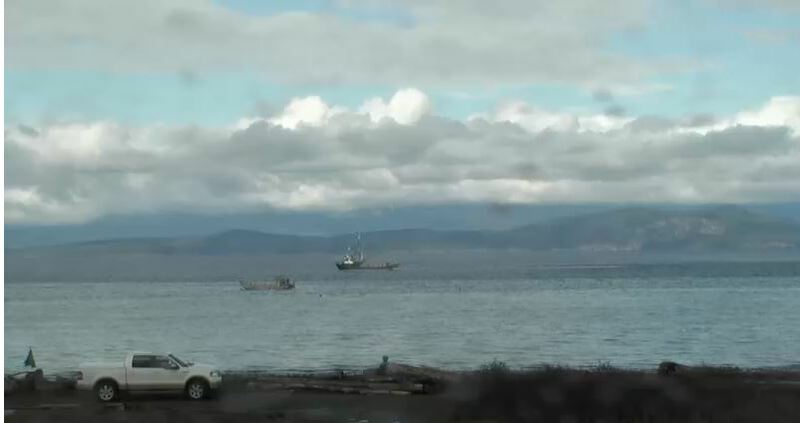 When I checked the Columbia Beach webcam - http://www.bigwavedave.ca/webcams.php?cam=2 - I could see that the ocean was discoloured and there were fishing boats passing by, so we decided to take another trip 'up island' to see whether the spawn now stretched to Qualicum Beach. 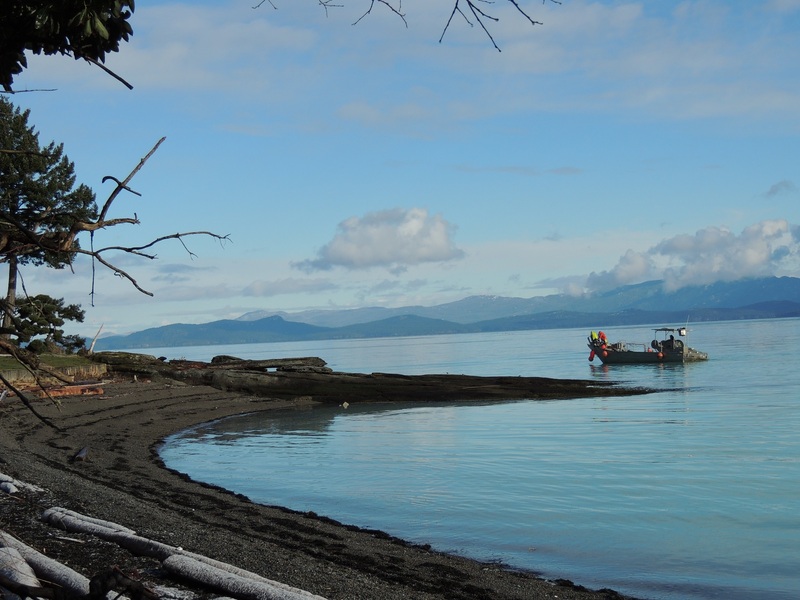 This was the view that greeted us, from where Columbia Beach webcam points towards Lasqueti Island, showing the area of spawn had indeed spread this far, and a couple of fishing boats passing by. 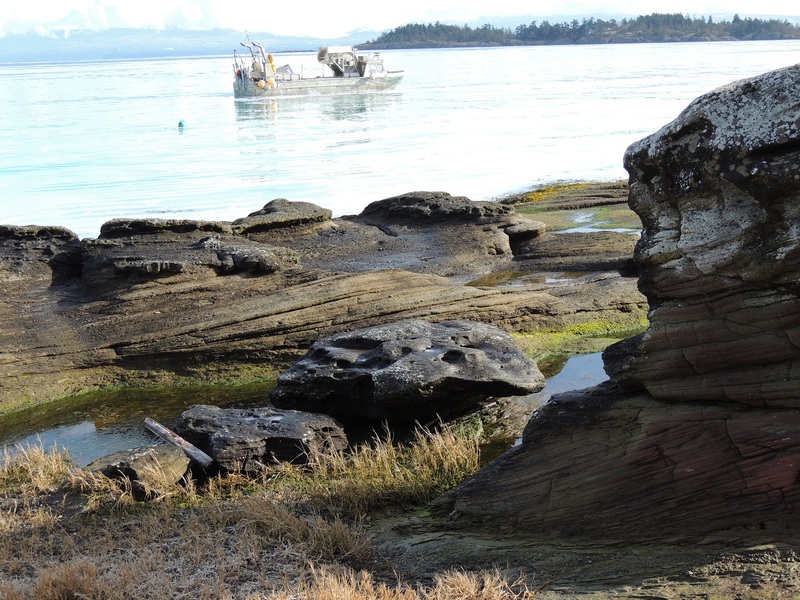 The above photo shows another view of spawn from Columbia Beach. 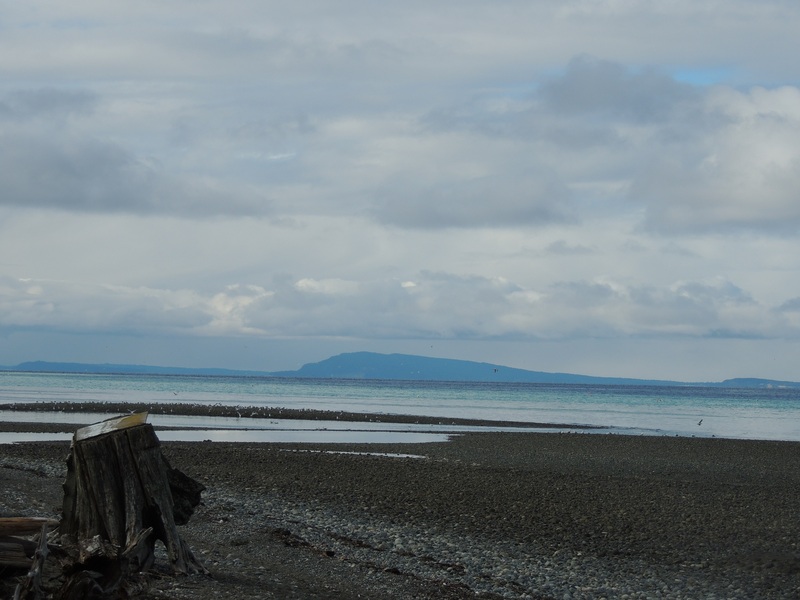 Columbia Beach view of spawn and a closer view of Hornby Island (where an eagle webcam is located). 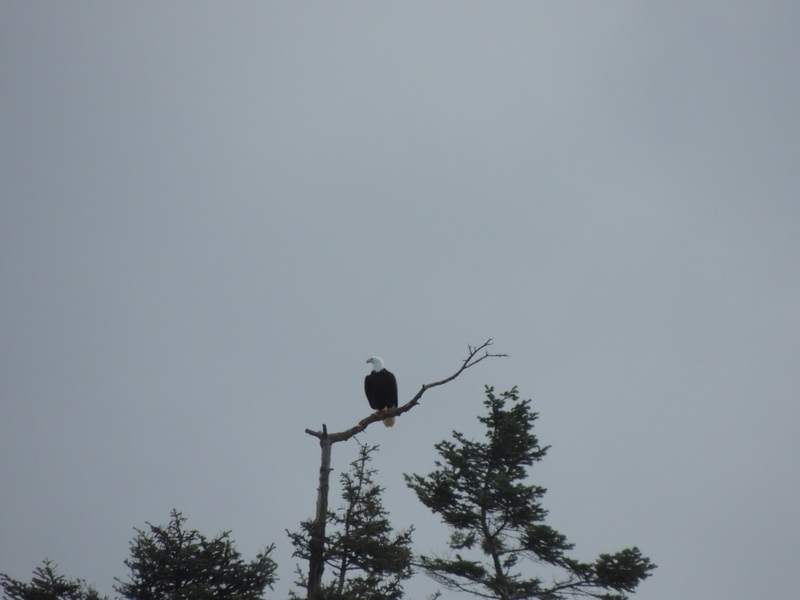 Behind us we heard eagles calling, and I managed to spot this one in a tree overlooking the beach. 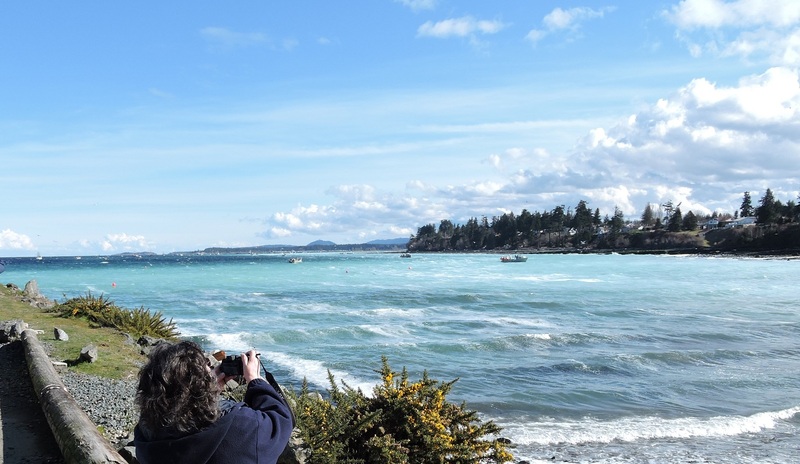 This video shows the panoramic view from Columbia Beach, looking first towards Parksville, and panning to Hornby at the end. 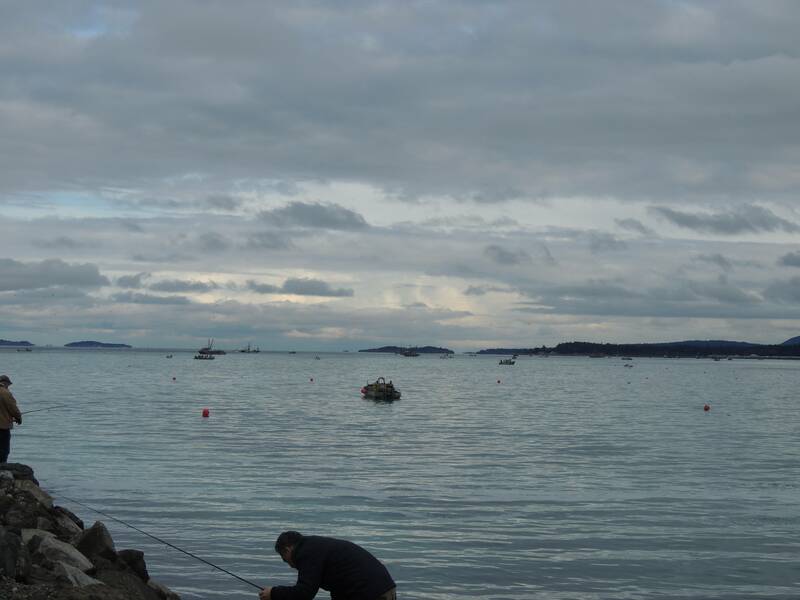 This annual Herring spawning event is so amazing; witnessing it has finally woken me out of the winter 'doldrums'. This year, as I said earlier, it is a particularly large one! I remember how moving it was the first time I witnessed it, to see this incredible sight, and to try and get my mind around the fact that zillions of these tiny fish were able to discolour the ocean! Nature is indeed, amazing. 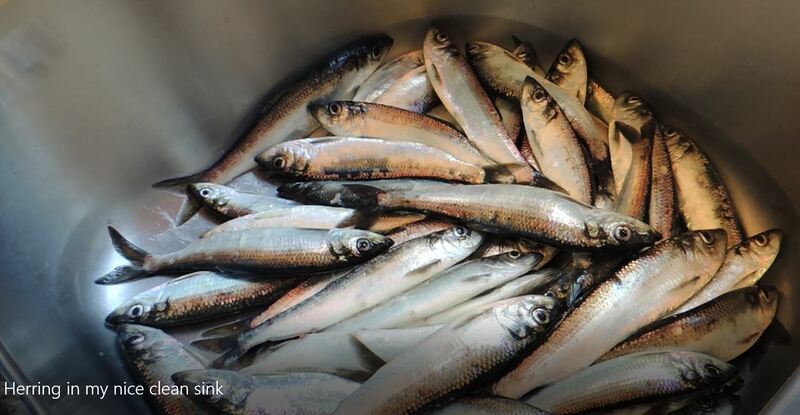 We can only hope that the commercial herring roe fishery comes to its senses and reduces quotas! These fish are caught primarily for their roe - the males and all carcases are turned into fertilizer or pet food, after processing to remove the roe - and the wild creatures both on land and in the ocean that depend on these fish in the food chain, are deprived. Old timers around my neighbourhood talk about the 'old days' when every year was a 'good year', whereas in recent years the spawning has been very variable. On Monday my husband went down to our local beach and was scooping up herring from the seaweed - there were so many stranded there, and he wanted a few for his own consumption. Imagine how amazed he was when somebody on a nearby (very close to shore) fishing boat called out and told him he couldn't have them - they were theirs! "We live here" was my husband's response! "Just watch me ..."
Herring milling around below our waterside deck. Last edited by vanislander on March 11th, 2017, 7:26 am, edited 1 time in total. After leaving Columbia Beach on Sunday, mentioned in a previous post, we went on to Qualicum Beach, and although we saw fishing boats passing by and more sea lions and gulls than usual, there was not a lot of spawn showing up, but if we craned our necks to the right we could see where the spawn 'strip' was. Unloading fish at French Creek. 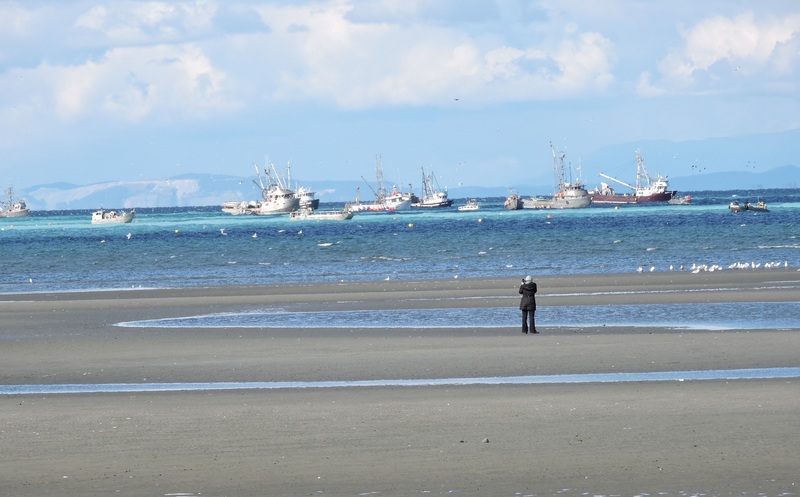 There were more people here this day, taking in the spectacle, and some were fishing/jigging for herring. 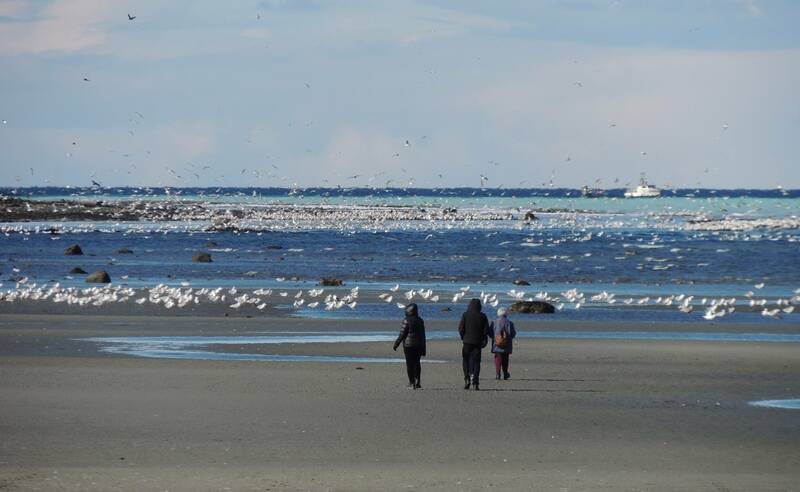 On Monday of this week (March 6), the herring spawning area was virtually on my doorstep. I heard lots of birds, some eagles, and sea lions close by. Athough it wasn't very sunny I could see that the water I overlook was discoloured with that lovely, telltale turquoise colour. 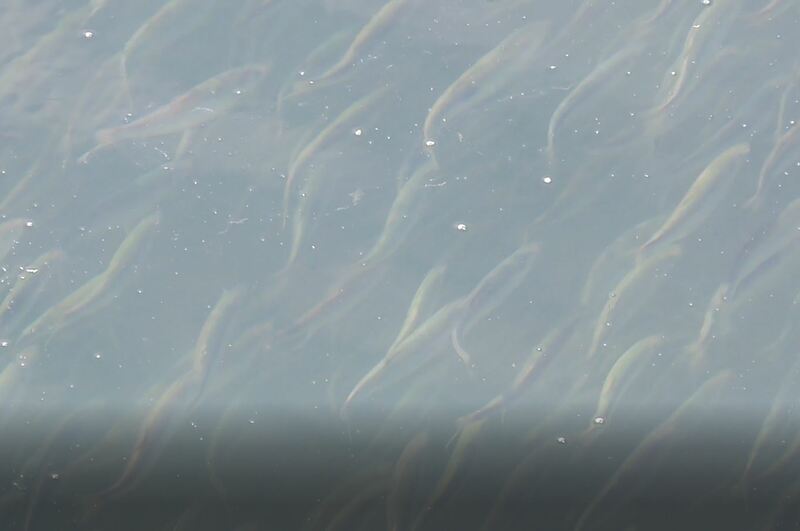 On going down to our little deck over the water I was amazed to see in the water huge, seemingly endless streams of herring passing by beneath, swirling around and glistening. 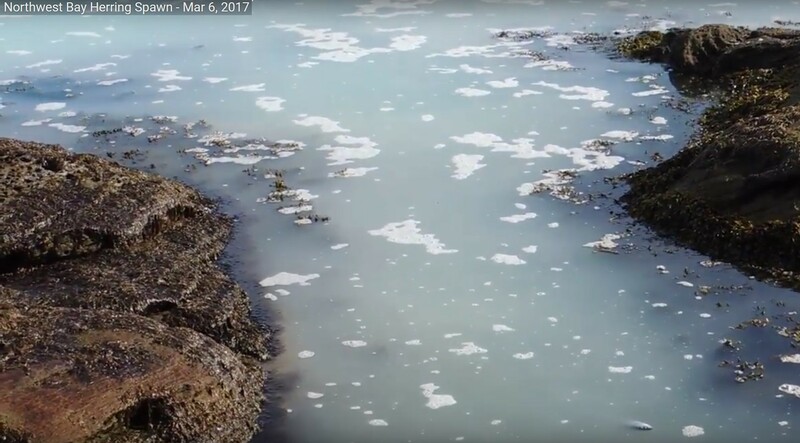 A quick check of the bay on the other side of our little peninsula showed discolouration there too, and herring boats arriving. This video pans the bay, and towards the end you can see Lasqueti Island (with Texada Island behind) - at the very end, Hornby Island can be seen as a distant speck on the horizon just to the right of the Point that comes into view! 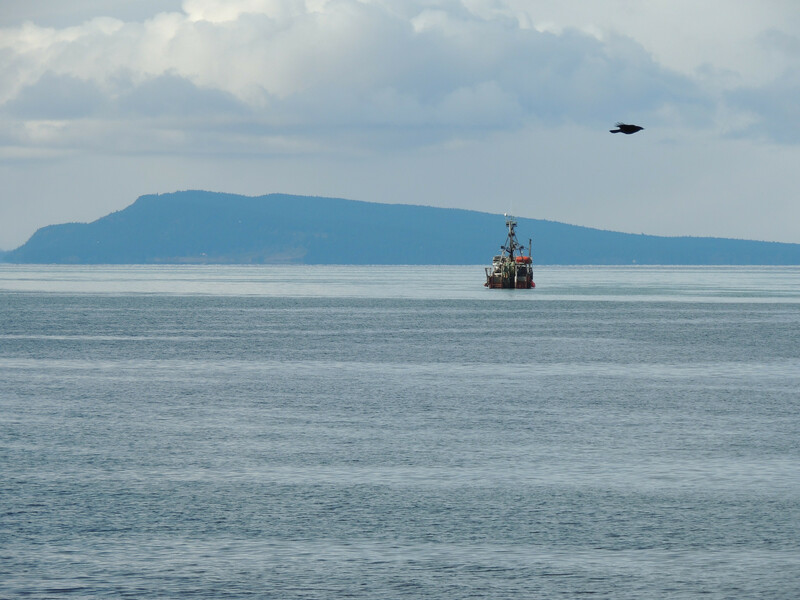 A herring boat passes Madrona Point, between Northwest Bay and Craig Bay. This is at the end of the peninsula on which I live. 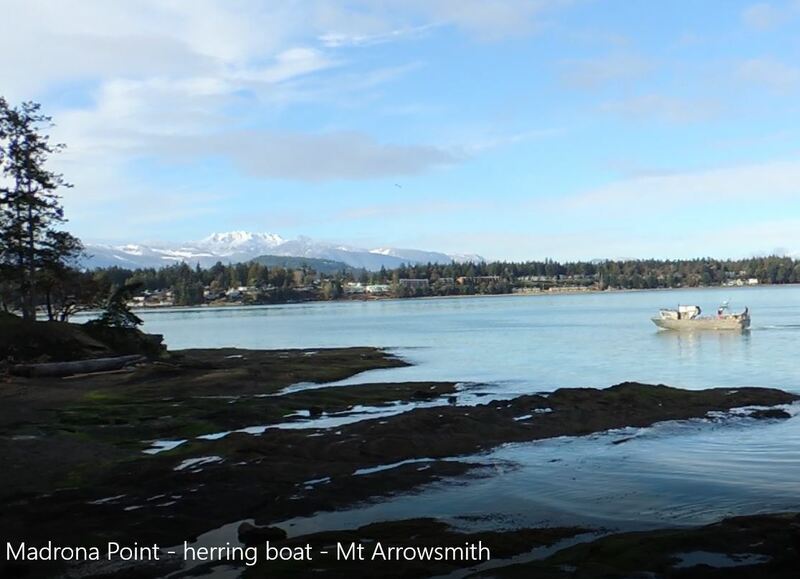 Herring boat passes Madrona Point, view towards Vancouver Island's Mount Arrowsmith. 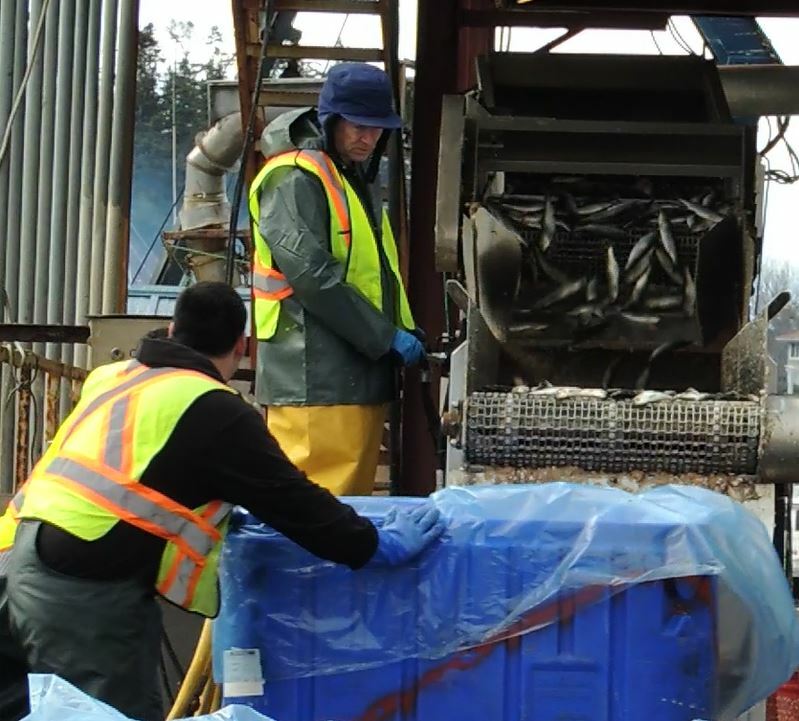 These videos show the herring being hauled into a fishing boat in Northwest Bay. That's so interesting. Thanks Van! Wow, you wrote a whole book! Wonderful coverage of the event ....Van....and descriptions. What a marvel to behold. Thanks for sharing with us.